Every August, Sacred Heart hosts their annual “Pack-A-Back” education campaign to provide school supplies to thousands of low-income students. This year is no different. The community service non-profit has been collecting new backpacks and school materials for the past month, and is distributing around 3,300 loaded backpacks to children at their offices on Friday. This year marks the 14th year of the drive as well as the record high number of supplies collected for students. Last year, a little over 3,000 backpacks were filled. Every child that pre-registered to receive a backpack will be able to choose one they like best from the thousands on display. Each backpack is filled with about $75 worth of school supplies, including notebooks and calculators, but this only covers a portion of the increasing cost of sending a child to school, according to the 2016 Huntington Backpack Index. 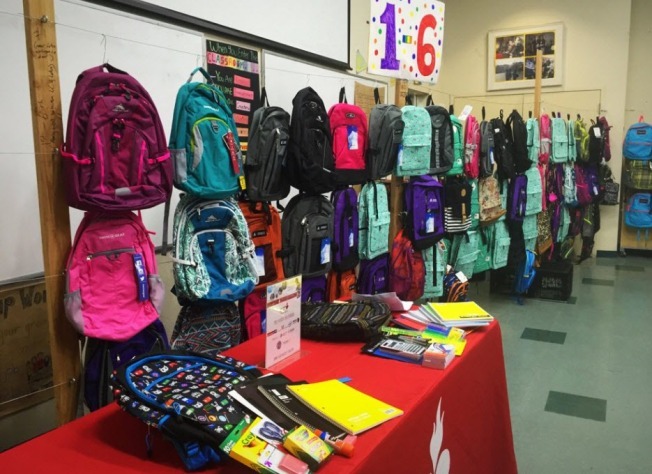 The increasing amount of children signing up to receive backpacks speaks to the growing amount of need in the Silicon Valley, according to Roberto Gil, the education program manager at Sacred Heart. It is becoming more expensive to send a child to school every year, and for families living on minimum wage, every purchase counts. The filled backpacks will be distributed at the San Jose Sacred Heart office from 9 a.m. to 4:30 p.m., located at 1381 S. First Street. For people who still wish to make a contribution, they can donate online at the Sacred Heart website.